In my work as an intern with the History Department here at Te Papa, one of the objects I’ve had the opportunity to work on is a memorial banner commemorating New Zealand soldiers from the First World War. I have been working to add more detail to the museum’s records around the lives of the soldiers who are named on the banner, and in doing so have had the opportunity to learn more about the story behind this fascinating object. Memorial Banner; circa 1919; unknown maker; cloth, cotton, silk, metal, wood and cord; Walton-on-Thames, Surrey. Early in the First World War, the New Zealand War Contingent Hospital was established at Mount Felix in Walton-on-Thames, Surrey, England. It was the first New Zealand hospital set up in England, and was soon re-named the New Zealand General Hospital No. 2. Initially plots in the nearby parish cemetery were acquired for soldiers who died in the hospital. Expecting a large number of burials, the War Graves Commission arranged for more than one burial to take place in each grave. 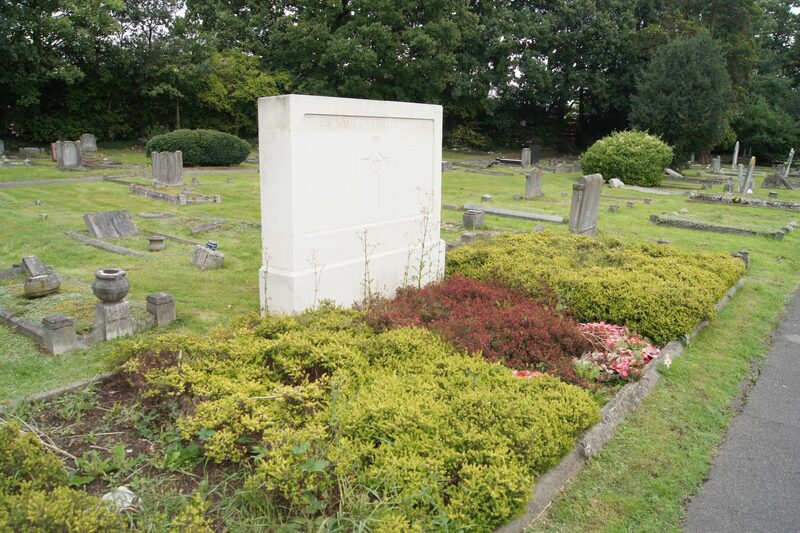 However, a larger plot became available in the nearby Brookwood Cemetery, and so fewer burials than was first expected took place at Walton-on-Thames churchyard. This meant that some of the grave sites which were used early-on contained multiple burials, while others remained empty. The names of eighteen soldiers and one nurse of the Voluntary Aid Detachment (VAD) are recorded on the banner, which was originally installed in the Walton-on-Thames Parish Church. It also shows the date they died, their military serial number, their rank and the unit they were serving with – very useful to the History team at Te Papa for locating their Military Personnel files and finding out more information about them. Detail of Memorial Banner; circa 1919; unknown maker; cloth, cotton, silk, metal, wood and cord; Walton-on-Thames, Surrey. Private James Livingstone Porter served with the Otago Infantry Battalion. He worked as a moulder before joining up early in the war and departing from Port Chalmers in October 1914. He died of wounds sustained at Gallipoli in October 1916. Corporal Thomas Wallace Phillips was part of the Auckland Mounted Rifles and the 2nd Reinforcements, he is mentioned on the War Memorial at Cambridge, New Zealand. Private William Fox’s name is recorded wrongly on the banner as ‘Cox’. He was a member of the Canterbury Infantry Battalion with the 4th Reinforcements. The spelling mistake has been transferred once more from the banner to the modern commemorative plaque which is now installed in the church! (See photograph below). Acting Corporal John Brian Dalton had previously had a long association with the Hawera Mounted Rifles Volunteer Force. He embarked from Wellington on 17th April 1915 to serve with the Otago Mounted Rifles as part of the 4th Reinforcements. He was slightly wounded at Gallipoli but had become seriously ill by the time he reached England, where he was admitted to the hospital at Walton-on-Thames and died on the 2nd December 1915. Corporal Henry Hudson was part of the Main Body of the Wellington Infantry Battalion who left Wellington in 1914. He died two years later from heart failure following pneumonia. Driver Arthur Hall was part of the Army Service Corps. He died of heart failure following an operation at Walton-on-Thames in June 1916. Driver William Henry Russell was part of the 9th Reinforcements of the New Zealand Field Artillery, he died of his wounds in September 1916. Rifleman Edward Rout was employed as a general labourer by J. Cole of Papatoetoe before joining the 1st Battalion of the New Zealand Rifle Brigade. He died of wounds inflicted to his right shoulder and right leg in October 1916. Private Kingi Hamana was part of the 1st Maori Contingent, B Company. He died of tuberculosis in October 1916. Private John Lewis Boyd was part of the Auckland Mounted Rifles and the 7th Reinforcements. His injuries left him paralysed from the waist down. He remained in England after being discharged from the New Zealand Expeditionary Force as his mother lived in Hampshire. He died in 1932 and was buried at Walton-on-Thames, so his name must have been added to the banner long after it was originally installed in the church, and only shortly before it was removed to make way for a more permanent memorial. Sapper Jack Fleming was married to Anne Charleswood and had two daughters, Annie Elizabeth and Nellie. He left his family in Auckland when he embarked in April 1916 with the New Zealand Field Engineers. He died of disease in October the same year. Private Montrose Baker from Gisbourne was a member of the Wellington Infantry Battalion and the 7th Reinforcements. He died from his wounds. Private Ramera (Raniera) Wairau embarked from Wellington in September 1915 as part of the 2nd Maori Contingent. He died of tuberculosis in October 1916. Private William Henry Rishworth of Dunedin was wounded by shrapnel whilst serving with the Otago Infantry Regiment in the 12th Reinforcements. He later died of his wounds at Walton-on-Thames. Rifleman George Blinko was a cabinetmaker from Hastings who served with the New Zealand Rifle Brigade before contracting pneumo-coccal meningitis and dying on 6th January 1917. Private Taura from Atiu, Cook Islands, joined the Rarotongans Unit of the 3rd Maori contingent, despite not being able to speak any English. He contracted tuberculosis and died in January 1917. Private Robert Black was husband of Alice Ann Black from Rarotonga and an accountant before he joined the Wellington Infantry Regiment. He died of disease in April 1917. Miss T. W. Bennet was a nurse in the VAD (Voluntary Aid Detachment) who worked at the New Zealand General Hospital No. 2. Unfortunately we have so far not been able to uncover any more information about her. Colonel Charles Mackie Begg was a surgeon in the New Zealand Medical Corps and became the Director of Medical Services for the New Zealand Expeditionary Force. He died at his home in Twickenham from influenza and pneumonia in 1919. Memorial panel, Walton-on-Thames churchyard. Image courtesy of Darren Bayley, Walton-on-Thames.org, 2011. In the 1930s, Colonel Begg’s brother wrote to the High Commissioner of New Zealand with several complaints about the visibility of his brother’s grave. After visiting Walton-on-Thames, he claimed that the graves were hard to find, that he found his brother’s name quite illegible on the gravestone, and that it did not list his full honours. As the Beggs were an influential family, the High Commissioner took the complaint very seriously, and sent the Director of Works from the Imperial War Graves Commission, a Mr. Sheppard who worked for the Imperial War Graves Commission, but was also a New Zealander, and a representative from the Office of the High Commission, all to inspect the site. A rubbing and a plaster impression were taken on the headstone and sent to New Zealand, where they are still held at Archives New Zealand in Wellington. The reports of all three officials concluded that the headstones were quite clear, and located just inside the entrance to the churchyard, so easy to find. As was standard practice with war graves, they listed only each soldiers’ rank and serial number, and were not separated into a separate section of the churchyard as so few burials had actually taken place. Still concerned that Dr. Begg would not be satisfied, the High Commission passed on all the recorded evidence to the Prime Minister in case the complaint should be taken higher! In January 1920, a ceremony was held at Walton-on-Thames Parish Church to install this embroidered banner which recorded the names of nineteen New Zealanders buried in the adjoining cemetery. 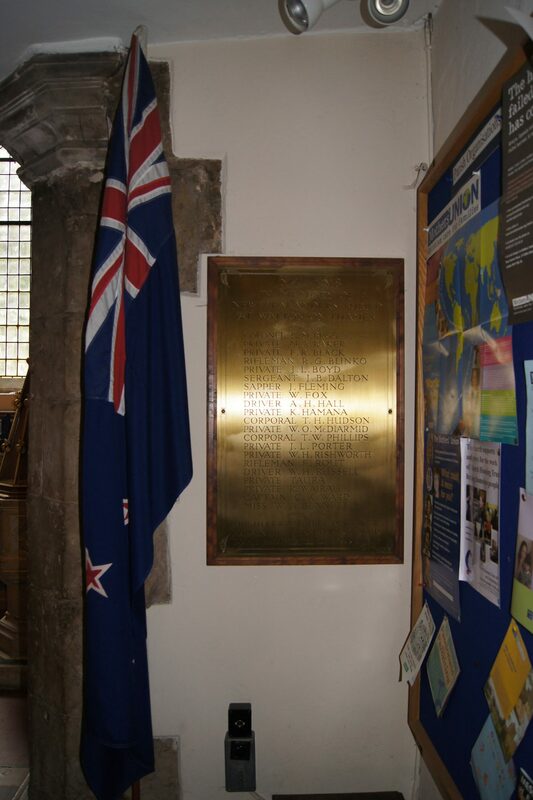 After its installation, this banner was taken out of the church to the graveside once every year as part of the Anzac Day service held on 25th April. In 1932, it was proposed that a brass tablet should be installed to replace the ageing banner. 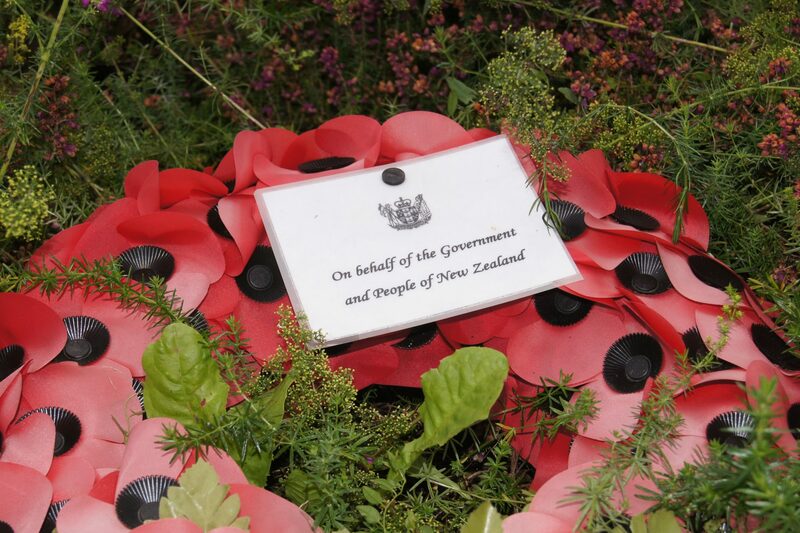 The Returned Soldiers Association of New Zealand raised money from their members to pay for the tablet, which also included the names of two further soldiers who were recorded as ‘Missing in the UK’, Captain C. K. Ward and Private W. O. McDiarmid. This was installed inside the parish church where it can still be seen today (below). Memorial plaque in Walton-on-Thames Parish Church. Image: Courtesy of Darren Bayley, Walton-on-Thames.org, 2011. The banner eventually found its way to New Zealand where it was presented to the Dominion Museum in 1961 by Adjutant General Brigadier McKinnon on behalf of the New Zealand Army Headquarters in Wellington. 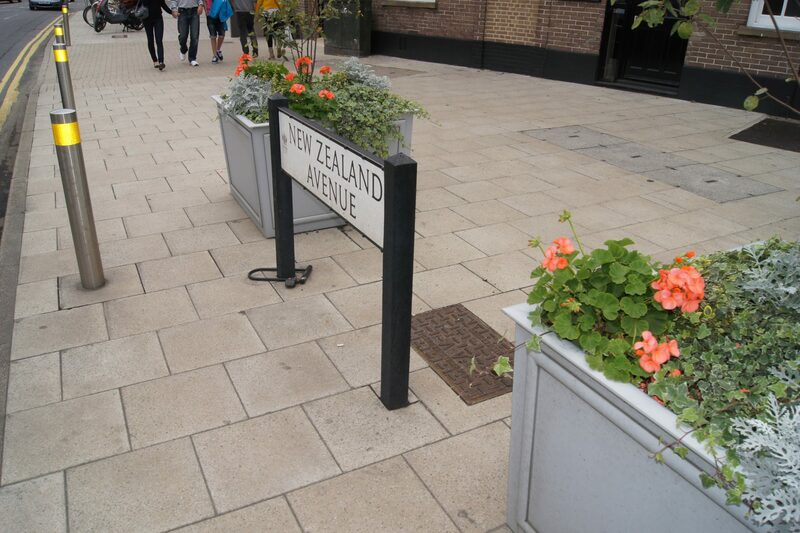 Today, Walton-on-Thames still celebrates its entwined history with that ofNew Zealandand the NZEF. The former site of the hospital atMountFelixis now at one end of a road built in the 1930s named ‘New Zealand Avenue’. 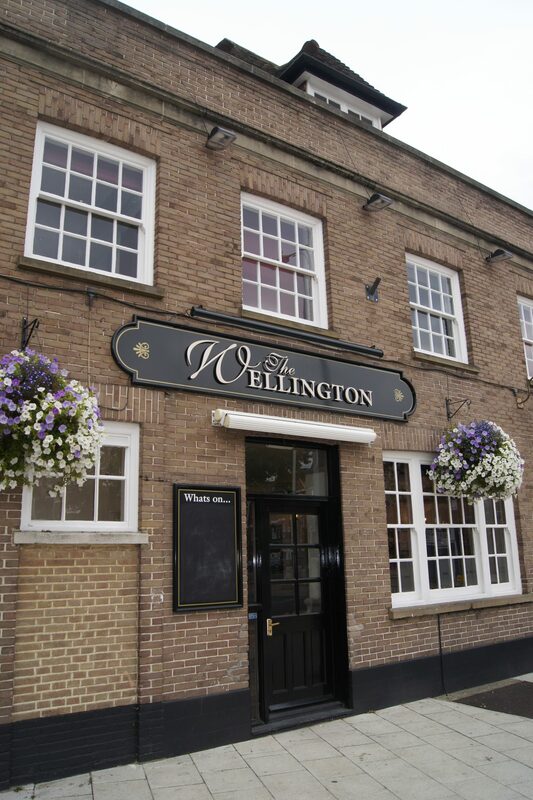 There is also a tribute to our capital in the naming of a local pub – the Wellington! The banner was made or ‘worked’ by one or maybe more soldiers during recovery at the New Zealand General Hospital. As well as a commemoration for those who had died, the process would have acted as a form of rehabilitation and way to pass the time. The apron pictured below is another example from the museum’s collection of an object made as a form of occupational therapy for an injured soldier. Apron; 1917-1918; Fred Hansen, sewer; silk. I stayed many times at my grandparents’ home in Walton,from early 30’s to c. 1950. It may be of interest to you that there was a pub in the main street called The Builders’ Arms,as best I recall; later it was The Kiwi. At some stage it changed again. ( I wonder why?) If this is worth pursuing,please check that I’ve got the story right! Grandpa was works manager for Louis Bleriot,making planes (for the RFC I suppose) close to Walton.Dad was his assistant ,my Mum to be and two of her sisters worked there ;and my uncle Alec probably knew the scene,as he was In the RFC very early on. I saw the item onTV about the Walton-on-Thames connection..I stayed often at my grandparents’ home in Walton,before ww2 and through to post war years.There was a pub in the town which I’m pretty sure was called The Builder’s Apprentice ; but later The Kiwi.The times I’ve been back since emigrating,it was something else again.If this is of interest ,please check for accuracy! I got rejected for doing a reduplication,and then couldn’t find how to amend things.So,I did the whole spiel again with a smal altercation to a pub name. Out was when I tried sending the second effort that the first showed up again.If you end up with both,just work out what makes most sense,please. Kind wishes again.I hope to visit later.My son in law in Wellington was in Defence HQ and has a huge interest in Gallipoli. 8/787 Pte. Porter, J. L., O.I. R.
16/779 Pte. Wairau, N.Z. P.B. 10/727 Cpl. Hudson, T. H., W.I.R. 5/236 Dvr. Hall, A. H., N.Z.S.C. 16/6 Pte. Kingi Hamana, N.Z.P.B. by a scroll bearing the words: New Zealanders interred in Walton-on-Thames. churches in England, beside two crosses cut in a stone pillar by Crusaders. I agree… the banner says “Miss Bennett W – VAD” (not Miss T W Bennet), this is my great-great-aunt, Wilmot Annie Bennett, of Otahoua, Masterton, who was serving with the Voluntary Aid Detachment Unit in England during World War 1. She died 21 November 1918 serving in the No. 2 New Zealand General Hospital, Mount Felix, Walton-on-Thames, England. She is buried in Plot: Screen Wall. 911. Walton and Weybridge (Walton-on-Thames) Cemetery, Walton-on-Thames, Elmbridge Borough, Surrey, England. Rest in Peace. I am very interested in hearing more about Wilmot Bennett as I am writing a booklet on the men and of course the one woman who are buried in the graveyard at St Mary’s Church Walton-on-Thames. If you have a photo that I can use please can you let me know. I have already written notes on the No 2 NZ General Hospital at Walton-on-Thames. Thanks very much for this corrected information about your great-great aunt. I will update our catalogue records. I have also now been able to find her service record which digitised on Archway (Archives New Zealand’s online database). was Wilmot Annie Bennett (known as Bob in the family) from Masterton who worked as a VAD at the hospital. Her brother-in-law, Dr Archer Hosking, also worked there. An interesting blog and thanks for it.in association with the Alexander Turnbull Library I am trying to identify the writers of hundreds of WW1 documents they hold. I have found that his half-sister Mary married Major Frank Symon of the NZ Field Artillery probably 1912 or 1913. Mary later worked in Mount Felix Hospital, It I could ascertain her single name I may identify the writer. I have no idea of his first name either. The Mary you seek is my grandmother, Mary Lexie Flux. She had a number of half siblings. Your author could be Arthur Llewellyn Flux or Harold George Flux. My dad, Francis Leo Ryan 14487 also fought at Passchendale. He was wounded in the right arm and admitted to admitted to Walton on Thames, April 1918. I’d be very interested in looking at your collection of photographs when they’re uploaded. I’m connected to Riverhouse Barn Arts Centre in Walton upon Thames (I worked with them last year when in the UK) and this year being a commemorative year to the beginning of WWI the arts centre are commissioning a piece of theatre or dance work that explores New Zealand General Walton Hospital. As I now live in New Zealand they have asked me to help them with gathering some stories about people who stayed in the hospital. We are looking for stories, copies of photographs, memorabilia that might contribute to the development of this work. We want to hear the stories from the New Zealanders who stayed there. If you’d like to participate, please get in touch. on 6 Jan 1917. A cabinet maker and first class cricketer representing Hawkes Bay he had married Annie Manson in Wanganui just before his embarkation to Europe in April 1916. I’m very interested in the post from Annette Atkins. My mother’s maiden name was Blinko and we were all born in Birmingham, Small Heath to be exact. My Grandfather’s name was Arthur Blinko born in 1903 but I kow he came from a big family. I believe his father was called Benjamin. Is it possible we come from the same Blinko bunch? Have you looked at his army records? he was certainly born in Birmingham in 1886. I can help you further if you are unable to find his records [no costs involved]. Roger, just wondering whether you are related to Lillian Blinko or Bernard Blinko? Papers Past 27 April 1916. MARRIAGE. BLINKO—MANSONv—At Wanganui on April 19, Roland G. Blinkp only son of Mr. R. G. Blinko, Staffordshirei England* to Annie C. Manson, daughter of Mr. N-.^ Peter Manson, of St. John’s Hill and late of Kai Iwi. I am writing a booklet for St Mary’s Church on the New Zealanders who are buried in their churchyard and if you have a photo of Rifleman Blinko that I can use please can you send it to me. If I get another trip home, Surrey, I shall visit Walton on Thames, I lived at Walton on the Hill, near Epsom.. Has there been a book one on the Walton On Thames soldiers? I now have my own copy of the Brockenhurst book.. Clare sent it to me.. I am writing a booklet on the New Zealanders who are buried in St Mary’s churchyard Walton-on-Thames on behalf of the New Zealand Women’s Association based in the UK so any information on these men would be welcome. That sounds really interesting. There is also a road which was built in the 1930s which is called ‘New Zealand Avenue’ as a tribute to the long association of the N.Z.E.F. with the town of Walton-on-Thames, it runs from the site of the hospital at Mount Felix and has a memorial stone placed on the centre of one of its roundabouts which also features a memorial plaque with the names of the 19 New Zealanders buried in the churchyard and the two missing soldiers. You would know about Brockenhurst? I have a list of the Kiwi soldiers buried down there, and a friend has them on his site as well in Hampshire.. Clare CHurch researched into these soldiers at Brockenhurst, she lives a Lymington.. came over to NZ to help with research. I will check with the friend see what he has on the Walton on Thames soldiers… its near where I come from originally… Think from memory there is a hotel(Pub) in town named after the Kiwis… many hands make light work!